Of all the idiocies I have entertained during my life, none has been sillier than my aversion to fish. I have no idea whence it came. In my home town there was a glorious fish market, constructed in Queen Victoria’s reign of glass and elaborately moulded ironwork, to which my Auntie Maud would take me as a youngster on her weekly shopping expeditions. I loved those visits, and marvelled at the sights and sounds of such an exotic place. Even today, the smell of wet fish will take me back half a century in an instant. Yet, by adolescence, I had determined that I would not eat fish. Perhaps, years before, one of the stranger piscine faces on those white marble slabs had frightened me. Not until decades later, when I was tempted by the exquisite – and non-fish-looking – dishes on the tasting menus of grand French restaurants, did I force myself to put aside this childish nonsense. I have had many occasions since to rejoice at my change of heart. And none has been happier than my visit to Aqua. Opened in 1991 and in San Francisco’s Financial District, Aqua occupies the ground floor of a solid building – restored after the 1906 earthquake – with a granite facade. Its external appearance is therefore somewhat sombre. But push on the bronze fishtail handle and pass through the plate glass door and you will be in one of the busiest and buzziest restaurants in this busy and buzzy city. It seats 120, the walls are cream and of plaster, the ceilings are high and the mirrors – there are five of them, I think – are huge. I normally like my dining rooms to be quiet, restful spaces, but even I was taken by the sense of occasion here. 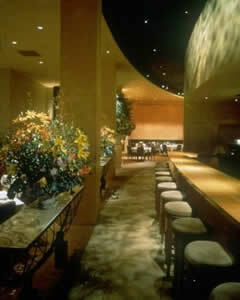 With its spotlights, its columns and its beautiful flower arrangements, this place knows that it is somewhere important. The Michelin inspectors agree, and have awarded it two of their coveted stars. I sat down on a banquette, with crisp white napery and good glassware (by Sant‘ Andrea) before me, and wondered whether I would concur. Certainly, the signs were good. The waiters – smart in waistcoats and brown silk ties – were diligent in replacing the napkins of those diners who left their places for a moment, and the General Manager, Karim Guedouar from Monaco (pictured), was delightfully friendly and charming. 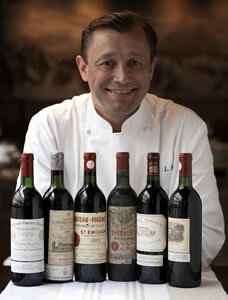 Laurent Manrique, the Executive Chef (pictured), has been here since 2003. He was born in Gascony, and has on his curriculum vitae a spell at my favourite Parisian restaurant, Taillevent. He is proud of combining French culinary technique with the ingredients of the New World, and has a passion for winemaking. 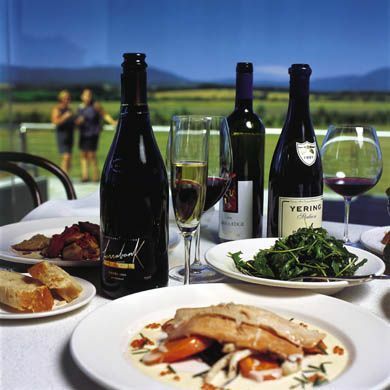 (He has been involved in the creation of several wines, including the 2003 Aqua Pinot Noir.) Together with his Chef de Cuisine, Ron Boyd, and his pastry chef, Lionel Walter, he was about to send to me a truly splendid meal. A seven-course tasting menu is offered for $130, but I went for four courses from the carte for $88. Three of these courses contained fish – for, of course, Aqua is an establishment at which the bounty of the sea is celebrated with joy and pomp. First came smoked Bay scallop, with chilled yellow taxi tomato gazpacho, cherokee tomato confit and Dijon ice cream. Here was the very essence of tomato, which caressed and flattered the sweetness of the precisely cooked scallop. Then it was on to the delicacy and prettiness of Monterey anchovy, with olive, baby fennel and a jus of roasted tomato. 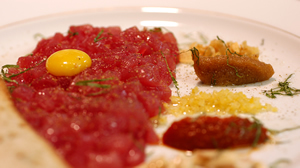 No one presented with these dishes could doubt the talent and intelligence of this kitchen. But then appeared the evidence of its true brilliance: Ahi tuna with squab breast. I had not before eaten tuna and pigeon on the same plate. The benefit they bestowed upon each other was near miraculous. This was a mutuality made in Heaven. And the supporting characters to this love story – quince, coffee-scented date, lentils and cardamom jus – played their parts by cheering on the happy couple. This was a dish wonderful in both conception and execution. I ended dinner with another happy dish: a good passion fruit soufflé. 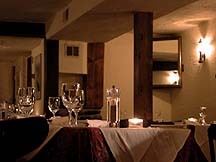 The wine list has around 300 offerings from around the world. The following caught my eye: Krug Grande Cuvée champagne ($390), 2005 DRC Montrachet ($4,500), 2005 La Tâche ($2,200), 1955 Latour ($3,600) and 1997 Far Niente cabernet ($795). Sommelier Ken Wagstaff – an affable fellow from Salt Lake City – directed me towards a red Côte de Nuits, with a vegetal nose but somewhat lacking in fruit (Gevrey-Chambertin, Les Evocelles, Vougeraie, 2002 - $155), and a truly gorgeous German riesling spätlese from the Mosel (Graacher Himmelreich, J.J.Prüm, 2003 - $105). Here was not only a bright petrol nose, but also intoxicating flavours of peach, apricot, banana and orange – and all with only 8.5% alcohol. This was a wonderful bottle of wine. And to think, for years I steered clear of German wines – just as I used to avoid the eating of fish. Now, thank goodness, the aversion to fish has gone and I am a wiser and a better man. That is why I can say this to you. 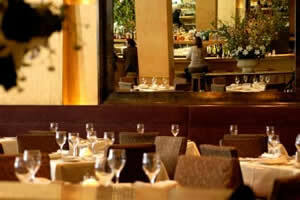 For those of us who love our fish, there is no better restaurant than Aqua. 252 California Street (at Battery), San Francisco, California 94111, U.S.A.
Open for lunch Monday-Friday, and for dinner daily. ***PLEASE NOTE: Aqua is no longer at this address. A new location is to be announced.